"THE MUSE captures wondrously the immediacy of memory which Cornellians will weave into lifelong nostalgia for their years on the hill." The Muse is an annual publication at Cornell University. Released at the end of the academic year every April, the publication gives graduating Cornellians an opportunity to reflect on their time at Cornell, as well as provide a forum for those reflections. 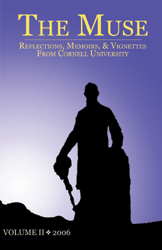 The Muse asks for short prose pieces, serious or humorous, about experiences at Cornell -- for example, recounting a memorable event, remembering an exceptional professor, or writing about one's (uniquely) favorite thing about Cornell. The Muse strives to run every piece submitted; rather than a literary magazine, it is an outlet for the expression of the diverse student experience, writers and non-writers alike. Read previous volumes of The Muse. Alumni - Sign up now for The Muse's mailing list! "College had done little to clarify the mechanics of the world, of nature and of people. But it had provided a better view of some of its far-flung constituents. When presented with words, people will always find a story. When presented with sound, they always contrive a composition. When presented with a past, they will always construct a history. The pieces fall where they do without much cause or consideration. The meaning is always added later. The lights down in Ithaca were twinkling that night. The faraway constellations of streets and neighborhoods mirrored the epic mythologies of the night sky above. Below, each glittering speck seemed like a little, dying light."